Above is a photgraph taken in Irish Air Corps in 2015 of a drum of Dichloromethane. This was in use by the spray paint shop in Baldonnel for stripping paint but was handed out to staff from any other unit that wanted some in containers like soft drinks bottles or milk cartons. Note : The European Union had banned this chemical 3 years earlier in 2015. 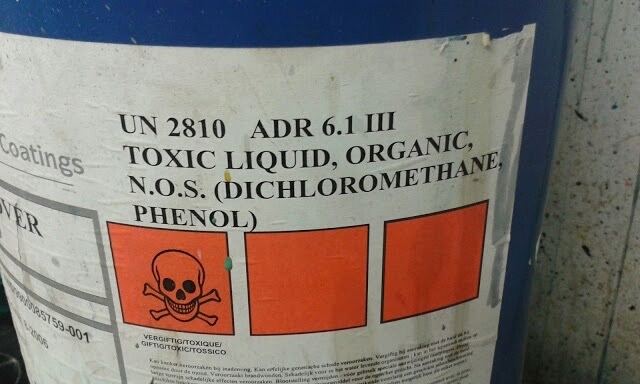 The current Health & Safety officer in Baldonnel didn’t know Dichlorometheane had been banned and in fact didn’t even know Dichlorometheane was actually in use as no chemical register was in existance at the time despite being mandatory since 1989. This was prior to the Irish Air Corps becoming LEADERS in workplace chemical Healh & Safety as “self-declared” recently to the Oireachtas Joint Committee on Foreign Affairs and Trade, and Defence. Methylene chloride is predominantly used as a solvent. The acute (short-term) effects of methylene chloride inhalation in humans consist mainly of nervous system effects including decreased visual, auditory, and motor functions, but these effects are reversible once exposure ceases. The effects of chronic (long-term) exposure to methylene chloride suggest that the central nervous system (CNS) is a potential target in humans and animals. Human data are inconclusive regarding methylene chloride and cancer. Animal studies have shown increases in liver and lung cancer and benign mammary gland tumors following the inhalation of methylene chloride. Note the MAX mathamatical/theoretical EPA level above of 200 µg/m3(0.2 mg/m3) equates to 0.05758ppm (parts per million). Dichloromethane was measured in ERF on Wednesday 12th & Thursday 13th July, 1995 at 175ppm. This equates to 607,880 µg/m3(607.88 mg/m3). So the level the EPA use to calculate a one-in-a hundred thousand increased chance of developing cancer were exceeded by the Irish Air Corps by a factor of 3,039. So statistically if a person inhalled the levels that many Irish Air Corps were exposed to 24/7 for a lifetime they would have a 1 in 33 chance of developing cancer as a result. Read the full EPA PDF on the above Hazardous Air Pollutant with references below. Dichloromethane was a component of Ardrox 666 used in ERF. 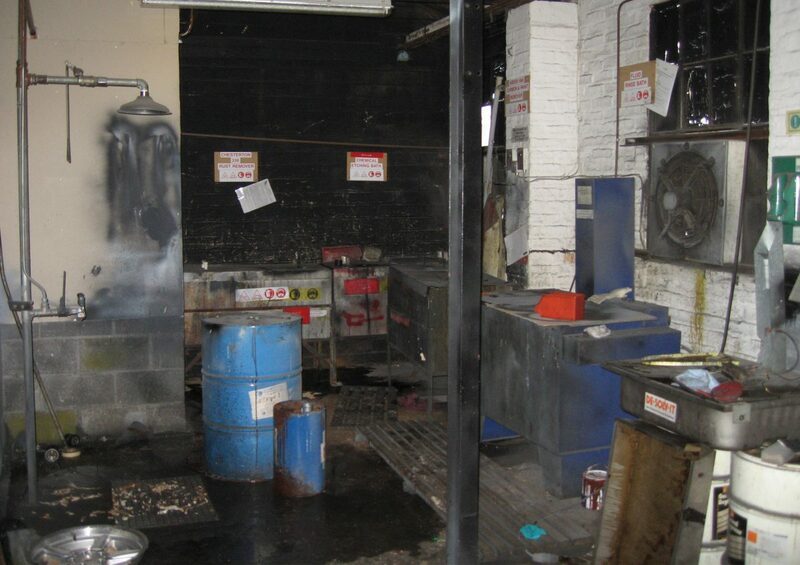 Dichloromethane was a component of the Paint Remover 82510 used by the Spray Paint Shop but also by technicians in No3 Sp Wing, BFTS & possibly elsewhere. There are possibly more chemicals used by the Air Corps that contain Dichloromethane. If you know of some let us know in the comments section. We are not statisticians and our interpretation of the cancer statistics are open to correction. Cresols, xylenols and cresylic acids are hazardous substances and dangerous both to people and the environment if handled improperly. Cresols, xylenols and cresylic acid products produced by Sasol Chemicals (USA) LLC are highly versatile materials and are used as intermediates in the manufacture of a wide variety of industrial products such as resins, flame retardants, antioxidants, and coatings. In these and other applications, cresylic acids can be stored, transferred, processed and disposed of safely when proper procedures and safeguards are used. “Cresol” refers to any of the three isomers of methylphenol (C7H8O) or combinations thereof. “Cresols” commonly refer to a mixture which is predominantly methylphenol but may also contain lesser amounts of other alkylphenols. “Xylenol” is a common name for any of the six isomers of dimethylphenol (C8H10O) or their various combinations. Material which is predominantly dimethylphenol but which also contains ethylphenols and other alkylphenols may be referred to as “Xylenols”. “Cresylic acid” is a generic term referring to various combinations of cresols, xylenols, phenol or other alkylphenols (ethylphenols, propylphenols, trimethylphenols, etc.). The purpose of this document is to provide information gathered through Sasol’s long experience in the safe handling of cresylic acids. It focuses on basic and practical information about working safely with these substances. Additional references are provided and it is strongly recommended that these and others be consulted prior to working with cresylic acids. Please do not hesitate to contact your regional Sasol office if we can be of assistance in the safe storage, handling, processing and disposal of our products. The primary dangers posed in handling cresylic acids are those resulting from physical exposure. Cresylic acids are highly corrosive and contact with exposed skin or mucous membranes causes severe burns. These burns progress from an initial whitening of the exposed skin to blackishbrown necroses within 24 hours after exposure. Cresylic acids also exhibit anesthetic properties. Therefore, victims frequently misjudge the extent of their exposure when the initial burning sensation rapidly subsides. This can result in prolonged contact, causing toxic effects in addition to the corrosive damage. Cresylic acids are readily absorbed through the skin and mucous membranes in liquid or vapor form and act as systemic toxins for which there is no established treatment. Relatively small areas of exposure (e.g. an arm or a hand) can allow sufficient absorption to cause severe poisoning. 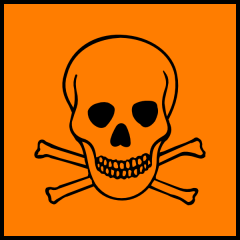 Progressive symptoms of such poisoning include headache, dizziness, ringing in the ears, nausea, vomiting, muscular twitching, mental confusion, loss of consciousness and, possibly, death from lethal paralysis of the central nervous system. Chronic exposure can lead to loss of appetite, vomiting, nervous disorders, headaches, dizziness, fainting and dermatitis. The Occupational Health & Safety Administration (OSHA) has established 5ppm or 22 mg/m3 permissible exposure limits (PEL’s) for cresols on an 8-hour time-weighted average basis. OSHA guidelines also indicate that adequate personal protective equipment (PPE) should be employed to avoid skin contact with cresols. Cresylic acids are not listed as carcinogens by OSHA, the International Agency for Research on Cancer (IARC) or the National Toxicology Program (NTP). Cresylic acids show high acute toxicity towards both fish and aquatic invertebrates and must be prevented from entering surface or ground waters. Depending upon the specific composition, the material may be classified as a marine pollutant. Please refer to the current label and safety datasheet. Safe storage, handling, processing and disposal of cresylic acids begin long before they ever arrive on-site. Measures necessary to ensure the health and well-being of employees, customers, the community and the environment include the development of effective administrative and engineering controls designed to specifically address the hazards associated with cresylic acids. Personal protective equipment (PPE) is integral to safe handling and should be viewed as the last line of defense against an accidental failure of the administrative and/or engineering controls. Administrative controls are the foundation of any program designed for safely handling cresylic acids. Every company is unique in how they run their business and establish administrative controls. Those specifically developed for working with cresylic acids should address comprehensive process planning, thorough communication of hazards to employees and extensive training of employees on the proper implementation of all safety measures. chemical mono-goggles, chemical-resistant or impermeable gloves, long-sleeved shirts and trousers as a minimum. Circumstances such as elevated temperature and pressure or vacuum conditions should dictate if more substantial protection is necessary, including face shields, chemically impermeable outerwear, and breathing protection. Personnel transferring larger quantities of cresylic acids, or working in areas where a line-break could result in similar exposure, should always wear full protective equipment. The primary dangers involved in working with cresylic acids are the corrosive and toxic effects resulting from a physical exposure. Studies suggest that the severity of the exposure depends more on the magnitude of the exposed skin area than the concentration of cresylic acid. Therefore, the critical factor in dealing with an external physical exposure to cresylic acids is to minimize the extent and duration of the contact. To this end, the immediate response must be thorough flushing of the exposed areas with copious amounts of running water to remove all the cresylic acid in contact with the skin or eyes. Any contaminated clothing should be removed as quickly and carefully as possible during this process to avoid any additional skin contact. Any exposed areas will have readily absorbed the cresylic acids and may be evidenced by a characteristic whitening of the skin. After thorough flushing with water, a solution consisting of 2 parts polyethylene glycol 400 to 1 part ethanol (PEG/EtOH) should be liberally applied to any affected skin (avoid contact with eyes), allowed to remain 15 to 30 seconds and then flushed away with fresh running water. Continue the cycling of PEG/EtOH and water for at least 15 minutes and then finish with thorough washing with soap and water. This decontamination procedure reduces the severity of the exposure, but does not completely eliminate damage to the skin or toxic effects. Medical attention should be sought as soon as possible. Spill containment and cleanup of cresylic acids should only be performed by properly trained personnel employing an appropriate level of protective equipment as dictated by the extent of the spill. Small to medium spills on land should be surrounded by and absorbed onto inert clay absorbent and transferred to a disposal container. Larger land-spills should be diverted away from waterways, contained with booms, dikes or trenches, and collected in a vacuum truck. Any residual cresylic acids remaining after vacuuming should be cleaned up using the clay absorbent. All soils affected by the spill should be removed and placed in approved disposal containers. Water spills are of particular concern due to the acute toxicity of cresylic acids to marine life. Clean up efforts should focus on containing the spill and quickly removing the cresylic acids that settle in deeper areas of the waterway. This can be aided greatly if the flow of water can be slowed or stopped. Further efforts should focus on removing as much of the dissolved cresylic acids as possible from the water using activated charcoal. The composition and extent of any spill should be evaluated against local guidelines (ex. SARA Title III and RCRA in the U.S.) and reported to the proper agencies, if necessary. Any non disposable clean-up equipment should be thoroughly decontaminated with soap and water after use. Below is a photo taken 10 years ago in the Irish Army Air Corps NDT shop, part of the Avionics / ERF building complex. Ardrox 666 can be seen spilled on the ground where it was free to leach through a shore onto the grass verge outside. 25% of fresh Ardrox 666 used by the Air Corps was Cresylic Acid. This percentage was higher in waste Ardrox 666 as Dichloromethane evaporated. That greenish / yellow stain dripping from the extractor fan is also Ardrox 666 from the air. The report referenced by the Deputy was prepared in the context of ongoing legal proceedings. As the release of the report could adversely impact on those proceedings, I will not be releasing the report. Being able to provide firm evidence of unprotected toxic chemical exposure through dangerous work practices, to treating doctors & consultants, may assist these medical personnel successfully diagnose & treat our colleagues. The State Claims Agency, who is advising the Minister and his department, does not give a damn whether serving or former personnel live or die and furthermore they couldn’t give two hoots about Minister Kehoe’s political career. Minister Kehoe needs to be fully aware that not releasing this document will cost lives. I propose to take Questions Nos. 810 and 811 together. As this matter pertains to litigation which is ongoing, it would be inappropriate for me to comment at this time. 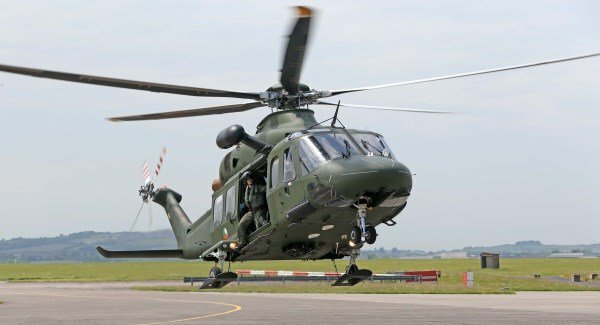 The Government says the Defence Forces have no intention of investigating how health and safety reports at the centre of an alleged ‘cover up’ within the Air Corps have gone missing. The State is facing at least six lawsuits from former Air Corps technicians who suffer chronic illnesses that they say were caused by their working environment at Casement Aerodrome. All six have seen a toxico-pathologist who has given his medical opinion that their illnesses — including cancer, depression, anxiety, sleep disturbance, and memory loss — were caused by their exposure to harmful chemicals. Last week the Irish Examiner revealed that health and safety reports arising from inspections of Casement Aerodrome in the 1990s — a period during which the six worked for the Air Corps —cannot be found by military authorities. Sinn Féin defence spokesperson, Aengus Ó Snodaigh, has told the Dáil that he has seen the reports in question, and that they are critical of health and safety management at Casement Aerodrome at the time. Mr Ó Snodaigh has questioned whether the disappearance of the documents is part of a cover-up to disguise the fact that the Defence Forces did not follow up on the inspections recommendations. However, despite confirming that the inspections in question took place, and that the reports arising from these probes cannot be located, Junior Defence Minister Paul Kehoe has said there are no plans to look into how or why the documents went missing. Read more on the Irish Examiner website. 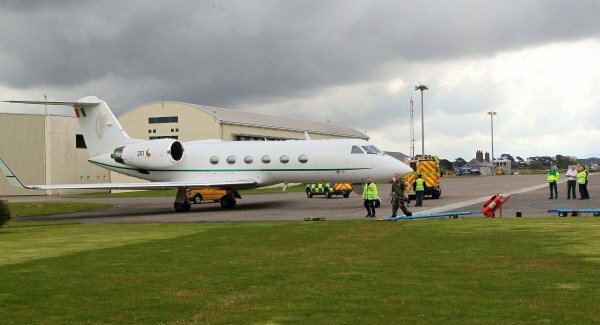 Revelations that the Air Corps has doubts over its own health and safety management raises further questions about the State’s treatment of former members who now suffer a litany of illnesses that they claim came as a result of their exposure to toxic chemicals. Today’s Irish Examiner reveals that an internal Air Corps report from 2014 cast doubt over whether adequate protection was given to technicians who would have worked with cancer-causing solvents on a daily basis. It also states that staff could have ingested the airborne chemical because their tea room was in an adjacent room, and that their clothes could have been contaminated due to their lockers being in the room where the chemical was used. The Air Corps could not find any records stating its staff had received any training on the dangers of the chemicals they were tasked with using. The details of this report come a week after this newspaper revealed that the Government “cannot locate” documents that opposition TDs say show that health and safety concerns were raised more than 20 years ago. The 2014 report’s admissions make the State’s refusal to investigate potential links between the workers’ illnesses and their exposure more inexplicable. It also calls into question the State’s decision to drag claims made by former staff through the courts. A 2014 internal Air Corps report into staff exposure to a cancer-causing cleaning agent over a 27-year period has cast doubt on whether the force did all in its power to protect workers’ health. The document states it is possible staff may have ingested the chemical and suffered other exposures because there was no record that protective measures were in place to mitigate the impact of the toxic solvent. The time under review in the report — 1980 to 2007 — coincides with the period during which a number of Air Corps staff who are suing the State would have worked at Casement Aerodrome, Baldonnel. It is understood the document was prepared for the State Claims Agency, who is defending the case in the High Court. The report, seen by the Irish Examiner, investigates the working environment in a since-demolished engine workshop building and was published over two-and-a-half years before the Health and Safety Authority raised a number of concerns about conditions in Baldonnel. In its summary on precautions taken with the Triklone N solvent, the report issued by the Air Corps’ Formation Safety Office asks “can the Defence Forces be found not to have done everything reasonably practicable?”. No records show that personal protective equipment (PPE) was made available to staff. No records exist suggesting that any training on the dangers of using Triklone N took place. Work areas were not segregated and doors to adjoining areas were left open. Workers’ tea room and meeting area were located in an adjoining area, raising the risk of food being contaminated. Workers clothes could have been contaminated as personnel lockers were located in the immediate area where the chemical was used. 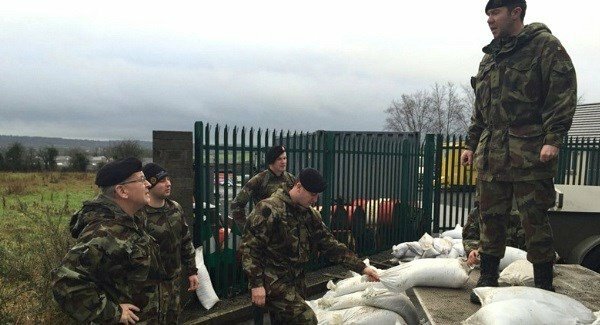 Fianna Fáil has called on the Government to establish healthcare screening for members of the Defence Forces, as well as a health package for those who have suffered illnesses as a result of their exposures while working for the State. 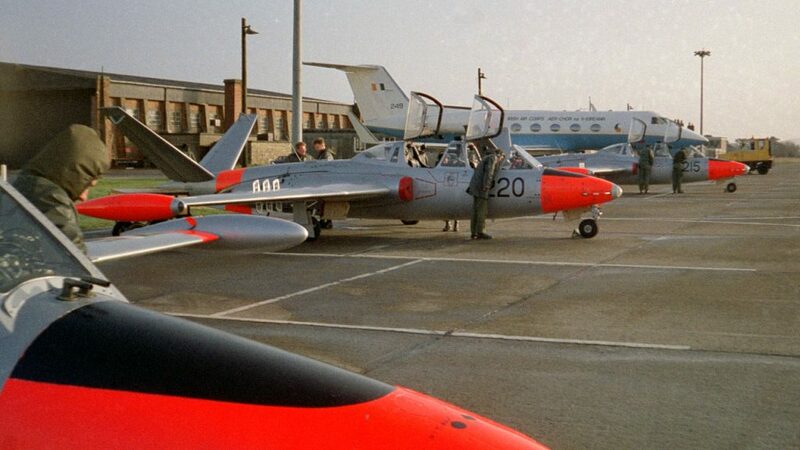 The demand comes as it was confirmed Junior Defence Minister Paul Kehoe has written to Sinn Féin to confirm that military authorities cannot find inspection reports from the 1990s that raised concerns about the working environment at the Air Corps headquarters at Casement Aerodrome. The confirmation came following attempts by this newspaper to have the documents released under the Freedom of Information Act. The State is defending itself in a number of legal actions brought against it by Air Corps staff who say they are suffering illnesses as a result of their exposure to chemicals while working at Casement Aerodrome. Fianna Fáil defence spokeswoman Lisa Chambers was critical of the Government’s approach to the matter. “It is quite astonishing that the Department of Defence cannot locate these reports given I and others have seen copies of same,” Ms Chambers said. “Simply saying they cannot be located is not good enough, there needs to be some explanation provided as to how these reports could have conveniently disappeared, given they point to serious health and safety issues at Casement Aerodrome dating back to the early 90s. At least six people are taking action against the State for alleged exposure to chemicals whilst in the Air Corps. 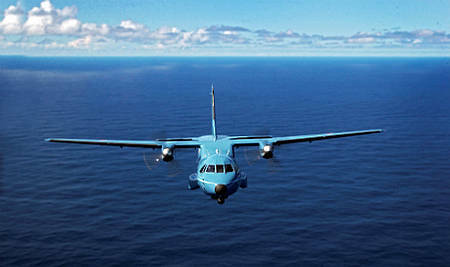 Reports detailing the levels of toxicity in the air at Baldonnel Airfield have disappeared, The Journal.ie can reveal. A letter seen by this publication, which was sent to a TD, says two reports into the measurement of potentially dangerous levels of carbon monoxide and other airborne toxins cannot be located by the Defence Forces. “I have now been advised by the military that there was a report on measuring CO (Carbon Monoxide) fumes from aircraft compiled by Forbairt [which later became Enterprise Ireland] in 1995 and a further report on monitoring air contaminants in workshops in 1997 which was also compiled by Forbairt. “In addition, an internal report was compiled by the Air Corps in 2014 in relation to a litigation case and in 2017, an occupational air survey was carried out by an independent environmental services company. Read more on The Journal website here.